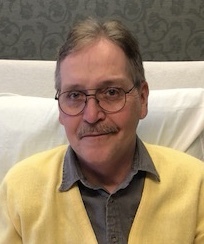 Terry Lee Schumann of Escanaba (Ford River) went to be with his Heavenly Father God, and his earthly father Duane, on Saturday, May 12 surrounded by loving family. Terry was born to Duane and Dona (Watros) Schumann on May 7, 1955 in Austin, Minnesota. He graduated from LeRoy High School in LeRoy, MN and Dakota County Vocational School in Rosemont, Minnesota. First and foremost, Terry was a wonderful father. He passed on a great sense of humor, a strong work ethic and dedication to family on to his children. He was a great partner. In 1986, he married Peggy O’Connell in Stewartville, MN. They moved to Escanaba, Michigan in 1996. Although they lived apart for the last 10 of their 32 years of marriage, they remained close for the benefit of their children and business. She stepped in to care and advocate for him in the last 9 months of his life as he battled cancer. Terry was a talented graphic designer. For the past 20 years, he worked closely with the marketing department at the Island Resort and Casino, creating their dynamic image. He also designed billboards for national restaurants and retailers; his design work is still evident all over southern Minnesota and Upper Michigan. Terry was a giving person. He was a member of and served on the board at Immanuel Lutheran Church in Escanaba, including as Board President. He was active with Hope at the Inn, designing the logo and publicity, and working tirelessly to further the ministry. Terry is survived by his mother Dona Schumann of Spring Valley, MN; best friend and caregiver Peggy O’Connell Schumann of Escanaba, and their children Molly (Matthew) Bauman of St. Paul, MN, Tim Schumann of Escanaba, MI, Bridget Schumann of Minneapolis, MN; his two older children Gabe (Chrissy) Schumann and Kelly (Jered) Iverson, both of Grand Meadow, MN; grandchildren Dane, Halen, Holly, Hudson, Izzy, and Emmy of Grand Meadow, MN; sister Marlene´ (Steve) Boyd of Spring Valley, MN; brothers Kim (Susan) Schumann of Apple Valley, MN and Tony Schumann of Mesa, Arizona; mother-in-law Dottie O’Connell of Escanaba, MI, sister-in-law Debbie (Ned Marks) Hiler of Sherwood Forest, WI; brother-in-law Dennis (Pat) O’Connell of Escanaba and many nieces and nephews. He was preceded in death by his father, Duane Schumann. Terry’s family would like to thank all those who helped Terry along the cancer journey, Peggy’s employees of SignUP and Positively for allowing her to spend a great deal of time with Terry and especially his dear friends Vince and Jane Walsh. He spent his last 9 months at Pinecrest Medical Care Facility in Powers, MI with the assistance of OSF Hospice. The care he received from the staff was outstanding. Special thanks to Cathy (Mabel), Tracey, Art, Katie, and all the others too numerous to mention. He truly loved being there because of all of you. Terry preferred a simple funeral which will be held on Saturday, May 19th, 11:00 am at Immanuel Lutheran Church in Escanaba with Pastor Hans Tolpingrud of Salem Lutheran Church in Bark River officiating. A lunch will follow in the church hall. The Schumann family is being assisted by Skradski Funeral Home in Escanaba. I only knew Terry from church. He was such a nice, caring man. I miss our conversations after church every Sunday. We met Terry and Peggy in 1984. We also had the honor to be Best Man and Matron of Honor at their wedding here in Stewartville in 1986. Sending our deepest sympathy. I had the privilege of working with both Terry and Peggy when they lived in Stewartville. Gifted “Twins” is a most appropriate description of them. Your memory continues on Terry! Terry was one of the kindest and most caring people I know. His love of God along with his love of family and friends was always evident when you were with him. His courage and positive attitude during these last few months always amazed me. You will be missed my friend. Our deepest condolences. May God provide peace and comfort during this time. Our deepest sympathy for Terry’s family. Peggy you are wonderful for all you have done. Even though you weren’t “husband and wife”, you were still married and you carried out your vows as promised to God. You are extraordinary! May God bless you and your children and all of Terry’s family during this time. I remember you both so well. Especially you, Peggy, and your involvement with the Stewartville Chamber of Commerce. Deepest sympathy to you and your family in the loss of Terry. Our deepest sympathy, to all the Schumann’s. Terry was a Special nephew, and such a caring person. Didn’t see much of him the last few years, but have many lovely memories of him in the younger days. I’m sure he is having a great time with Duane in Gods house. So sorry none of us can make the funeral, but will be there in thoughts and prayers. (RIP) Terry. Rejoicing in Paradise. Uncle Curt and Aunt Geneva. My Sympathy to the entire family. Hugs to all! I was married to Terry’s cousin, Todd Scaglione, years back & Terry was a great guy! rest in peace terry,and may god bless your family. cousin don. Peggy – I so enjoyed our talk a few months ago and it brought back so many great memories of when you and Terry were in Stewartville! Oh the crazy times!! Prayers to all! Tomorrow is not a “given “. And you soul is happy from living. Because one day he’ll come to call, when the time by him is right, to bring you to the stars in the heavens, for your grandkids to pray to at night. Prayers and deepest sympathy to all of Terry’s family. Graduated from L.O. With Terry back in 1973. He was truly a great guy. Prayers to all.